The Schwinn 230 Recumbent Bike, a mid priced recumbent exercise bike, comes with a number of bells and whistles that can help with getting a more effective comfortable low impact cardio workout in your home. It has a large console that includes pre-set programs to help with getting the workout you want as well as monitor how you are doing. The bike can be adjusted for the level of intensity you want using magnetic resistance and also be adjusted to your size to get a more effective and comfortable workout. At the price you do seem to get a lot of extras but it’s important they work as you’d want. There are a few things on how they work to be aware of to be sure the bike that is the right one for you. In this review all these things are covered as the result of in depth research of the bike and how it performs. The single piece frame and oversize tubing provide a stable and secure platform. There is no wobbling or shaking as you exercise at whatever intensity you workout at – all the way from getting started through to more vigorous exercising and intensity. There are 3 levelers on the bike to level up the bike when floor is a little uneven. Two are on the back stabilizer bar and one in the middle of the frame rail (runs between the front and back of bike just above the floor). These keep the bike stable and the one on the frame helps to ensure the frame rail doesn’t flex. As to how long it will last, customers that have had it for a year or more find that it is holding up well to constant use without any issues. It is still solid and they expect many more years of use. The frame comes with a 10 year warranty, 2 years on the mechanical parts, 1 year on the electrical and 90 days on the labor. This is a good warranty period for exercise bikes. The horizontal position of the seat can be adjusted to allow it to fit a range of different heights. From customer feedback it seems it fits people comfortably between 4 ft 11 ins and 6ft 3 ins. Some people below 4ft 11 ins have said that they can use the bike comfortably but that does depend on the length of their leg. To make the seat adjustment there is a lever at the side of the seat that you press down while off the bike. You then move the seat to the position you want – backwards and/or forwards. You do need to get off the bike to make this adjustment. To lock it into place you need to lift the lever up. Your leg should be slightly bent at the most forward position of the pedal. This is the position you want you aren’t restricted to pre-set holes. It is one of the simplest and quickest adjustments methods available in this price range. It avoids the usual loosening, removing/inserting and tightening that you normally have to go through. This only takes seconds to do so makes it able to be used by multiple users (although only two user profiles can be set up in the computer). The 13 lbs perimeter weighted flywheel helps to keep the pedaling smooth through all the levels of resistance avoiding choppiness or pulsing you get with lighter flywheels, although you may still find it gets a little uneven at higher resistance levels. It builds up inertia or momentum that helps to pull the pedals through the entire pedal stroke so that you get a 360 degree stroke rather than a more up and down motion like you do on a stepper and lighter flywheels. The bike has a one piece crank (the crank arms and spindle are all made in one piece) that seems to hold up well to pedaling at all levels of resistance and intensity with it holding. They’re not as strong as the 3 piece cranks such as you get with the Schwinn 270 Recumbent Bike but customers find the pedals and crank arms on this bike are firm and there is no flexing. The Q Factor is 8.75 ins (the horizontal distance between the pedals) so your legs will be wider than you’d find on an outdoor bike. The straps are plastic with holes that you insert the plastic knob on the pedal to hold them in place. They should fit shoe sizes through to size 13. You do have to be a little careful to avoid the strap ripping when undoing them. You don’t have to use the straps as you’ll find your feet stay on the pedals anyway. Seat. It looks more like a chair than a bike seat. It is made from molded plastic that has holes to help ensure you don’t get to hot. With it being plastic you may find that you slip forward on it as you pedal and that it dips downward slightly meaning that you have to adjust your seating position from time to time. As with many bike seats some people find that the seat is comfortable even though it isn’t padded but others hate it including the shape of the backrest. The people that find it tough have found that folded towels or cushions on the backrest and seat help with comfort issues. It has a step through design and the seat is at a good height to make it easy to get on and off the bike for all levels of fitness and ability. Handlebars. There are 2 sets of these. The main pair are either side of the seat as you’d expect with a recumbent bike. They have the pulse sensors that you grip when you want to monitor and/or exercise using your heart rate. These handlebars are level with the seat but are in easy reach for providing stability and gripping when you want to monitor your heart rate. The 2nd pair is at the front on the console post that curve upside either side of the console itself. They don’t have heart rate sensors. You can use them for when you want a more upright and bending forward riding position for a change of position or when making changes to the console to give support while continuing to pedaling. Both sets of handlebars are covered to make them easy to grip and prevent blisters when your hands get wet. They also help with giving you something to hold on to when getting on and off the bike. Dust and Dirt. The bike isn’t going to add much to your chores. It does need to be cleaned down to prevent sweat from damaging it but the bike itself doesn’t generate much dust. Sweat can be very corrosive so wiping it down regularly helps keep it looking good and working well. You may want to put it on a rubber exercise mat to prevent sweat from dropping on to and damaging your floor. Noise. It is a quiet bike and you won’t be disturbing others as you workout. The loudest noise is likely to be your heavy breathing. You can watch the TV (although on an angle due to console blocking the view if straight on) and exercise while others watch or sleep in the house without disturbing threm. The bike has a footprint 64 by 28 ins. It doesn’t fold up for storing.. It weighs 81.6 lbs. There are small transport wheels at the front of the bike that you tip the bike onto when you want to move the bike. They hold most of the weight of the bike for you so you just need to navigate the bike. You may find them sticking when used on carpet as they don’t have that much clearance. If you are wanting to move it across a wood floor it’s a good idea to check the wheels don’t scratch or dent the floor. The bike is delivered part-completed. The time to finish the assembly is about 1 to 2 hours for most people. It is not difficult with the instructions reasonably easy to follow. The manual comes in English, French and Spanish. It includes the tools needed for the assembly but you may also want scissors or a utility knife to cut away the packaging. The frame and drive are delivered together. You are required to add the stabilizer bars, pedals, handlebar, seat, backrest, water bottle holder, console post and console. The hardware is attached to a piece of cardboard that labels each part which makes it easy to find when called for in the instructions except for the console where the screws are in the holes. The pieces all line up and there is no forcing needed to get the parts together. It is recommended that there be 2 people assemble the bike to make it easier to handle and hold some of the heavier parts. In particular attaching the monitor is where an extra pair of hands can help to hold it in place while it is screwed and the wires connected. The console allows you to set the program you want to follow or you can just use the quick start setting and pedal, control resistance levels, see your progress, store your workout results (for 2 profiles) and upload to Schwinn Connect (a fitness account) and myfitnesspal.com. At the top of the console is the USB port and MP3 port. The USB port can be used to keep your MP3 or tablet charged (it won’t charge them but it will stop them draining while in use) and is also where you can insert a USB drive to download your workouts to your fitness accounts. The MP3 port is where you plug in the media cable (included) to use the speakers. Below that is the large upper display. This shows user information, course profile (graphically- like a bar chart with the higher the bar the harder the resistance and showing progress along the course with a flashing bar), the level of work from 1 – 10, your current heart rate zone, a goal display showing current goal selected (distance, time, calories) with how much to go and percentage completed. It also has an achievement of a goal display and when a goal is achieved you get a celebratory beep. It can give you a little boost of motivation when you hear it. Under this display is the 2nd smaller display (this isn’t covered up if you have placed a tablet on the console). This is divided into 3 columns – with it showing speed (mph or km/h) and time in the first column, The 2nd column has distance (miles or kms), resistance level and RPM. The third column displays calories and heart rate. At either side of ths display are large up/down buttons for changing the level of resistance up or down a level. Below this are 5 buttons on either side of the console which are quick level resistance buttons giving you the ability to jump to a level of resistance. The levels that you can jump to are 1, 3, 5, 7, 12, 14, 16, 18 and 20. In between these buttons is the quick start button, the programs button, pause button and goal button and arrow buttons for setting up console and selecting workout programs. There are also 3 small indicator lights that let you know if you’ve achieved a goal in the current workout, last workout or the last 7 days. There is also the button for controlling the fan speed in this section. Underneath this section you have in the center of the console the fan and either side of it the speakers. The handlebars at the side of the seat have pulse sensors that need to be gripped to use the heart rate programs and monitor. You hands need to be moist and warm to get the necessary contact to have the best chance for an accurate reading. This doesn’t work with a heart rate strap. The displays aren’t backlit so in poor light conditions it can be difficult to see the numbers displayed. You save your workout results to a USB stick and use this to upload them to the Schwinn Connect and myfitnesspal.com to analyze and track your workouts over time and see progress towards your fitness goals. You can then share them with others if you want. The bike plugs into the house supply using the supplied 4 ft (approx) power cord to use the monitor and resistance. If you don’t have power you can’t use the resistance. (No batteries are required.) You don’t need to keep the bike plugged for the console to continue to store your information. To set up the 2 user profiles you enter name, age, weight, height, gender and preferred workout values. The user profiles allow your calories burned and heart rate zones to be tracked more accurately – if you don’t update them you’ll get results based on a default profile. If there are more than 2 of you wanting to use the bike they can but their results will be added to the last profile selected. There are 22 different workout programs that come with the bike. They are 9 profile, 8 heart rate (4 beginner, 4 advanced), 2 customer user defined, 2 fitness tests (beginner, advanced) and 1 quick start. You don’t have to follow a program and can just exercise as you want and adjust the resistance as you go using the buttons on the console. The quick start button allows you start a manual program that is monitored in 2 minute blocks in the upper display. You can set your own resistance by pushing the resistance buttons. It defaults to resistance level 4. The first set of programs are the profile programs. There include fun rides, mountains and challenges. You can modify them for the goal and value of calories, time and distance. The fitness tests are a set program that increase resistance until you reach the test zone and measures your heart rate and power output (watts) . It gives you are fitness score that you can use to measure improvements over time. The heart rate tests train you in 4 different heart rate zones based on a beginner or advanced. There is a good range of programs there that can be modified but it can be even with the manual a little confusing to know which of the direction buttons to push each time. You gave to go into the programs each time to select the one you want – there is no one button to push to select a favorite so you can get started straightaway. The manual that does come with the bike doesn’t fully explain many of the features of the console but you can download the full version from Schwinn Fitness site. To start the console you plug it into a power source, press any button or you start pedaling. It turns off when there is no activity detected after 5 minutes. It doesn’t have an on/off switch. The bike comes with a number of accessories that help improve the comfort and convenience of your exercising. The large water bottle holder is side mounted by the seat close at hand although can be a little awkward to reach. It is designed to fit through to large size water bottles. It has as part of the console a shelf that you can place a table, ipod or book. It holds them in place firmly. It’s not going to fit a laptop. They will cover the top part of the console display but it does have a second LCD display that displays measures to keep you up to date how you are getting on with your exercising while you read your kindle, watch a movie or listen to your music etc. It has 3 speed fan in the console that can help cool you down when you get hot. The control is at the lower center of the console. The fan doesn’t blow that strong and is best described as a gentle breeze even at the top setting. 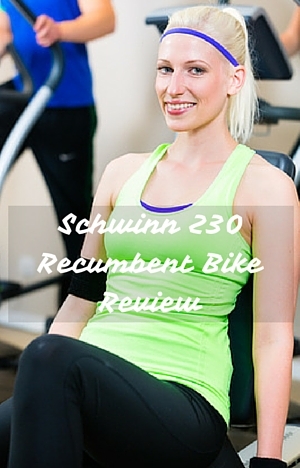 Going through over 100 customer reviews it is evident most of them get a recumbent exercise bike where they like the quality of it for keeping them safe and secure as they workout. Also they like the variety of pre-set workout programs and the ease of switching between resistance levels. They also find the pedaling motion smooth. As you’d expect there are some that don’t like the bike – with people commenting on the lack of comfort of the seat (as you get with a lot of exercise bikes especially in this price range), the height range (people over 6 ft 3 ins find it too small), the console not being as intuitive as they’d like. Plus a small number have had a bad experience with customer service when they’ve had reason to contact them, although others talk about how good the service is. However, overall customers say in their reviews they are impressed by the bike and use it to help with rehabbing or generally getting fit, tone up and lose pounds. You get quite a good number of added features for the price. There’s the magnetic resistance, weighted flywheel for a more fluid bike riding experience, the console with pre-set programs, 2 user profiles and a seat slider to adjust the bike to your height. On Amazon it qualified for free shipping and Prime. The bike is great for those who are beginners through to more advanced. If you want pre-set workouts it comes with 22 different programs that you can also tailor to your requirements. This provides you with a number of options to exercise (including not using the programs and just getting on exercising how you want). You can upload your information to a fitness account for tracking and monitoring. It is adjustable to fit a variety of users. There are a number of accessories that come with the bike to provide more comfort and convenience as you exercise. There are a few problems like the console should be easier to use, the seat can be uncomfortable, it has only 2 user profiles and it would be better if it was compatible with heart rate straps. For the price it this is very good value for low impact cardio exercise in your home you can set at the level you want so it can help with recovery (under doctors advice) as well as general fitness goals including toning and shaping or losing weight. We just finished putting it together. No power. Where do I start to troubleshoot? You could check that the cables are attached correctly and if that doesn’t work I’d get in contact with the supplier. Just bought a 230 bike, it is so hard to pedal. How do I make that adjustment? It’s a great exercise bike for the price. The only complaint I have is how user unfriendly the control panel is. I use it daily and have a custom program set up and even then I’ll have trouble getting to my program. Thanks for this – I agree they could make the control panel easier to use. I assembled the 230 recumbent bike and everything is working great except the small fan below the display is not working. And ideas? Sorry, I can’t help. I’d contact Schwinn Fitness who can help you troubleshoot and if necessary help with replacement.